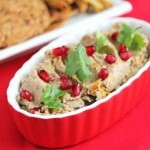 Eggplant Walnut Dip is a heart healthy dip that is inspired by a traditional Georgian Eggplant and Walnut dish. 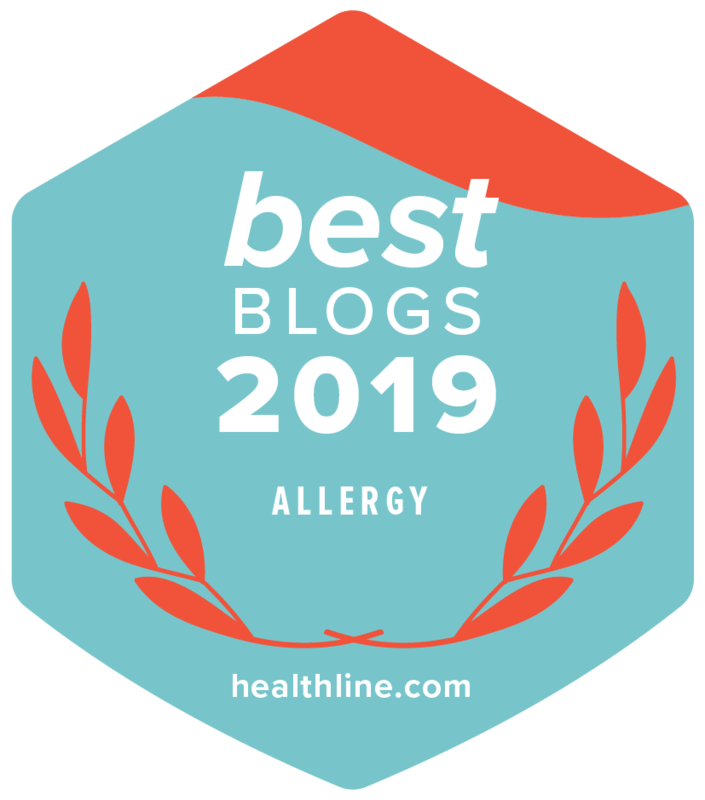 A few weeks ago, I wrote a post about heart disease, the #1 killer of women, including how to best prevent heart disease, what a heart healthy diet looks like, and what makes nuts heart healthy. 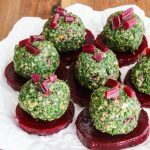 In that post, I shared a recipe for Georgian Spinach Walnut Balls, inspired by a feast on the eve of the Georgian New Year. 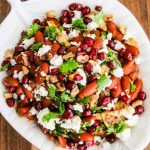 This month, I’ve been adding walnuts to lots of dishes, including Braised Pomegranate Chicken with Walnuts, Dark Chocolate Walnut Pomegranate Clusters, and the Eggplant Walnut Dip recipe that I am sharing today. Walnuts are heart healthy, helping to lower cholesterol and reduce inflammation. Reducing inflammation can help decrease the progress of arteriosclerosis, the development and build-up of plaque in the arteries. Walnuts contain more ALA omega-3 fatty acids than any other nut, which help reduce the potential for heart disease, cancer, stroke, diabetes, high blood pressure, obesity and clinical depression. Walnuts contain a high level of an unusual form of vitamin E (gamma-tocopherol) that has far more powerful anti-inflammatory actions than the alpha form. The night of our Georgian feast, we dined on all sorts of dishes made with walnuts, including an appetizer simply called Eggplant with Walnut, which was pan-fried eggplant, stuffed with a mixture of ground walnuts and spices, and rolled up. I wanted to try recreating this dish at home, but didn’t want to be bothered frying the eggplant, plus I wanted to make a healthier version if possible. 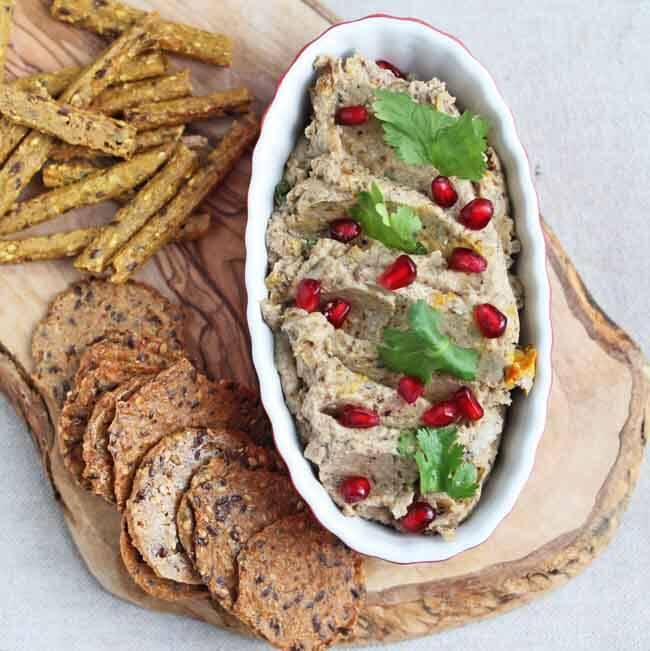 I thought about baking the eggplant, but in the end made this Eggplant Walnut Dip with the spices and herbs that are used in the traditional Georgian eggplant and walnut dish. 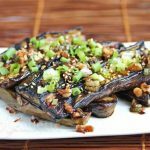 I came across a post on Everyday Maven (which she actually found at Clean Green Simple) that had an interesting method for roasting eggplant on the stove. I was fascinated by the way the eggplant was charred over the gas stove, then put into a pot to finish cooking. Perfect for getting that smokiness of roasted eggplant without turning on the oven. I had bought mini eggplants from the Indian store, so they did not sit too easily on my gas burner. In fact, they fell into the crevices of the burner a few times and I had to rescue them from the flames. My boys thought I might set the house on fire. Next time, I will try using longer eggplant, perhaps Japanese eggplant. This Eggplant Walnut Dip can be served with carrot sticks, celery sticks, toast, or sturdy crackers. Disclosure: I was provided with samples of Nuts.com products for writing this post. However the opinions expressed in this post are my own. 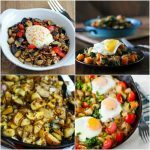 For more heart healthy recipes, check out my Heart Healthy Recipes Pinterest board. Great giveaway— I would love to win the Black Walnuts, I keep hearing about how wonderful they are. 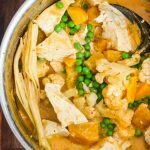 Your dip looks amazing, and the ingredients are so unusual, I can’t remember the last time I used fenugreek! Black walnuts are unusual. They are stronger tasting than regular walnuts, and I actually preferred the black walnuts to regular walnuts when I made some dark chocolate walnut pomegranate clusters for Valentine’s Day. Great giveaway, I would probably get pecans! I would definitely want to make if I won! So pretty and flavorful. Oh, I totally love this one, Jeanette! I adore walnuts and eggplant! I guess I’d have to go with walnuts if I won. I adore them! I would want to try the hickory smoked almonds or the Jordan almonds! I am loving this dip – but no gas burner so must roast in oven which is not fatal. I was going to make an eggplant recipe this eve but they did not look great – so will save this for when some decent eggplants enters my world again. I love all sorts of eggplant dips but I can’t say I’ve ever had one with walnuts. With the combination of the two, this is healthy squared! The walnuts definitely add a nice richness and creaminess to this dip, plus some heart healthy oils. well, I would always choose cashews, because I snack on them daily and use them in cooking a lot. 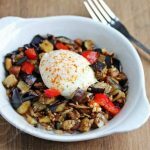 THIS looks SO good… I love eggplant and new ways to use it – I will be making this, I already have walnuts. thanks for the information about them, too. This is the ideal snack! I truly love all nuts. They serve so many purposes; as garnish, desserts, snacks, meals! It’s difficult to pick just one kind, but cashew nuts would be really nice to have for all their wonderful vegan uses! I’m totally obsessed with walnuts at the moment so I’d want those! Pinned and following on Pinterest. Stumbled and following you on SU. I’d like to win pecans please! Would love to win raw cashews. Love making smooth cashew cream as a substitute for cheese since I’m vegan. Thanks for the giveaway! I’d love to win some pistachios. Can’t get enough of them! This dip looks wonderfully delicious! 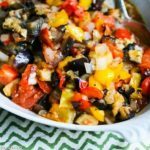 Eggplant and walnuts…a great combo! Thank you for giving me a new healthy recipe. I have been on an almond kick lately so I would like to win raw almonds. 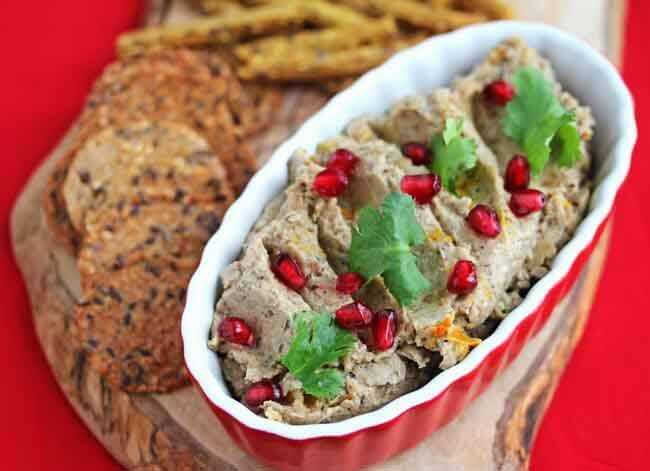 the eggplant walnut dip sounds DELICIOUS! i love mixing roasted veggies with nuts! i make a roasted red pepper cashew dip and it was so addicting. Love it. Another great way of sneaking in eggplant into my husbands diet without him really knowing it. What great dips you’ve been creating Jeanette. wonderful giveaway – i love nuts of all type. in looking at the website i came across roasted walnuts and as i don’t think i have ever had those think i would try them. I’d choose pine nuts! I use them in lots of recipes. This dip looks amazing btw. Love eggplant in everything and anything! 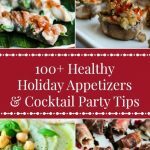 First time visiting, I just discovered your blog and I enjoy it a lot. I was looking at your healthy pantry list and wondered where you like to shop? I try to buy organic as much as possible. 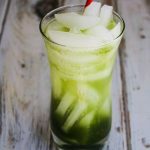 Have you mastered the organic but not break the bank shopping yet…I have yet to do it as well as I’d like. 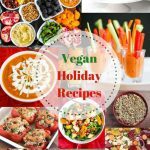 I shop at all different stores, and now that many regular grocers carry good fresh produce, I often shop there since the prices for organic products are less expensive than specialty stores. In the summer, I join an organic CSA (Community Supported Agriculture) which is less expensive than buying organic produce from the store. Organic produce is expensive so I focus on buying organic on the dirty dozen list (http://www.organic.org/articles/showarticle/article-214). We adore eggplant. I love this dip!! I can see how the walnuts can complement the eggplant! i love eggplant dip and this sound like something I;d really enjoy, with some fresh cut veggies or homemade crackers. mmm.